Works with USB device of any size i.e., 2GB, 4GB, 8GB, 16GB, etc. The pen drive recovery software is designed with a set of recovery algorithms that it recovers lost data from pen drive in the exact format as the previous one. Whether there is loss of document, videos, images, music, or anything else, the tool will be extracting all kind of data from targeted USB drive. 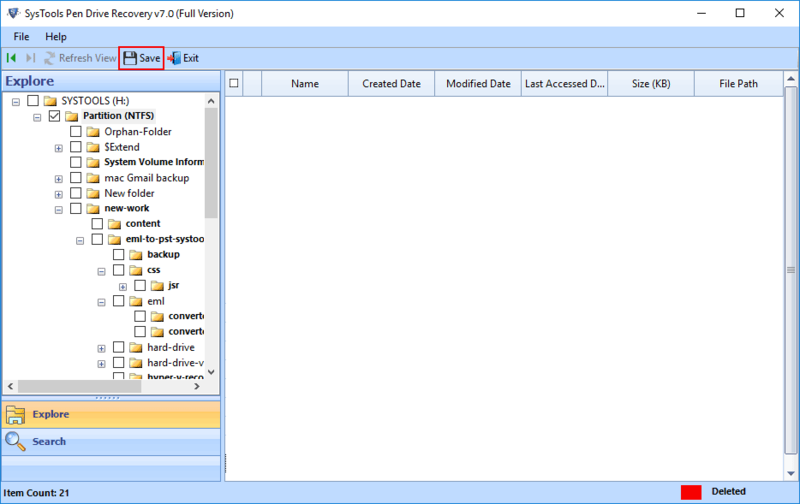 This Wizard is capable to recover permanently deleted (shift + delete) data easily. a)Scan: To retrieve permanently deleted data from pen drive. b) Formatted Recovery: Restore data from formatted pen drive / USB. The USB drive data recovery software is designed in a way that it restores corrupted files from USB. There will be no harm to the extracted files and folders, which were earlier corrupted and then, extracted by the software. The application is one of the excellent solution to recover corrupted data from USB. The USB data recovery wizard helps customers in determining only the desired files and folders for recovery purpose. Only mention the text or term, which is related to the required data, in the searching field of the software. This will be dealing with extraction of only desired files from bulk amount of recovered data. In general, users format their pen drive whenever virus occurs in it. Although this technique makes the pen drive virus free but, it also leads to the entire data loss. So, the USB drive data recovery software equips feature to get back data from NTFS / FAT32 formatted pen drives. After software launch, click on Scan button, users will view all the external storage components listed in front of them. One need to click on the desired USB drive, which they want to repair with this USB Data Recovery Wizard. The Software automatically starts scanning chosen drive and hence, data extraction gets started. 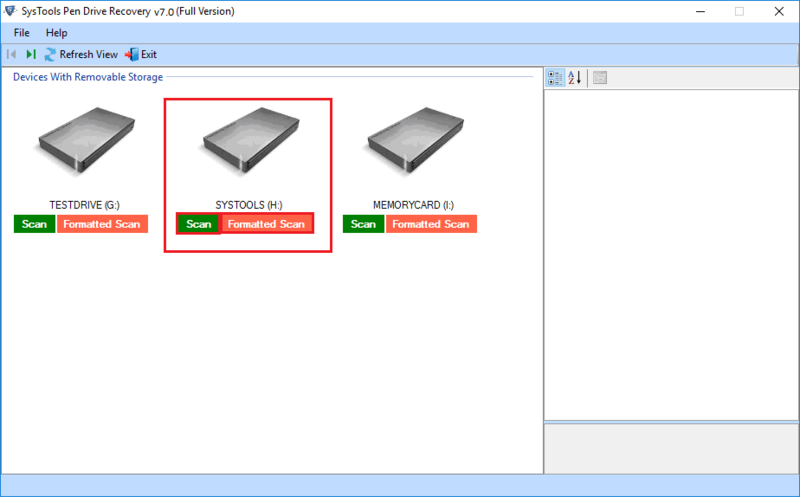 The USB file recovery tool is providing a very useful option to preview extracted data from the chosen drive. All the folders with their sub-folders get listed in a tree format on left-hand side of the screen. 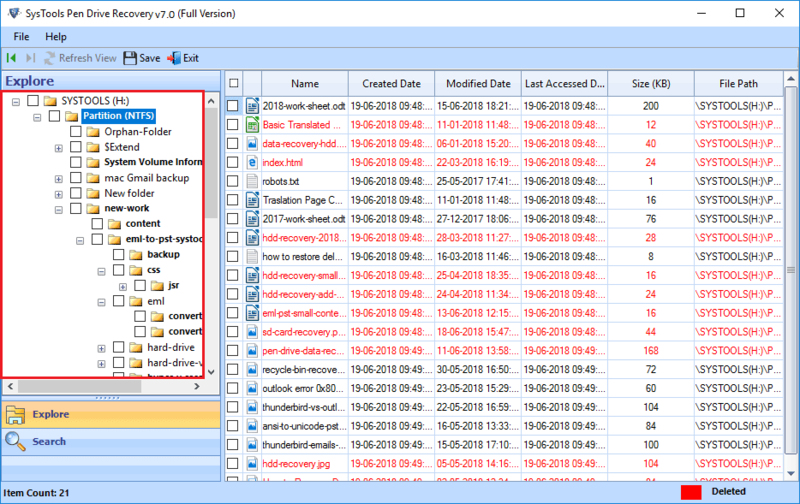 Click on a particular folder to explore all files of this in the middle pane of the product. The pen drive data recovery wizard renders an additional feature to save extracted files and folder from scanned pen drive. Files are saved in the same extension as they were before corruption or damage. Apart from all this, it is possible to export selective files or folders just by checking their checkbox from the tool wizard. Can I recover shift deleted files from Pen Drive with help of your application? Yes, the USB drive files recovery software is having capability of retrieving back the shift deleted files from the chosen pen drive. Will your software help me in retrieving data from undetected pen drive? No, the pen drive needs to be detectable on the system where USB data recovery Wizard is installed. What all technical knowledge or training is need to work with your recovery tool? No, technical training or knowledge is required to operate our software. The tool is designed in a way that even a novice user will be able to work with it. Is USB file recovery tool workable with the damaged pen drive? No, the pen drive recovery software does not works with broken or damaged pen drive. The USB needs to be in a working condition, which is easily detectable by the PC. How much time is needed to recover data from corrupted pen drive? Well, the time duration is totally dependent upon the quantity of files and folders. Talking about this online usb drive data recovery wizard then, it takes shortest time period in comparison to all others available in market for the same. 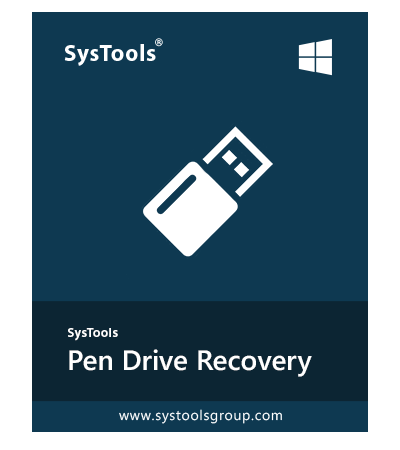 Download pen drive recovery tool online and install on your PC then, open it. 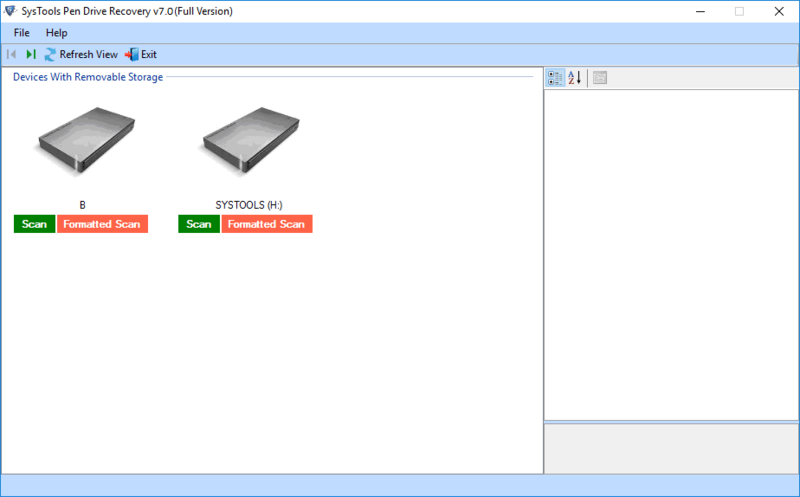 The USB data recovery software will start scanning chosen drive and then, load the recovered data on the preview panel. When the data completely gets loaded on preview pane, you can use advance searching to preview only the desired data. Click on Save button and save the regained or retrieved files at any desired location. "I work in an IT firm and this advance piece of the product is unlike anything else I have ever seen. I am very much impressed with the way this application works. Each and every module of USB drive data recovery software is easily understandable and hence, ease in working too. I am feeling delightful after working with this product. Thanks a lot!" "The USB data recovery wizard is made with all the capabilities, which are required to recover shift deleted files from Pen Drive. Spending dollars on this product is completely full of worth. I do not have a single complaint regarding this product and will definitely recommend it to all others who are looking for the same. Amazing tool for pen drive recovery!"